For today only, you can get a free grilled sandwich at Jack in Box and a free short stack at the International House of Pancakes. And let’s not forget that Pacific Beach’s Broken Yolk Café is also offering great specials today. Certainly, today is a bookmark day for food—free food! At Jack in the Box, if you purchase a large fountain drink you’ll receive a free grilled sandwich—no coupon needed! This free offer is Jack’s method of introducing the public to his new items: the turkey bacon cheddar sandwich and the deli trio sandwich. Both are grilled and said to be made with fresh ingredients. The turkey bacon cheddar sandwich is made with a sun-dried tomato sauce, and the deli trio is made up of Genoa salami, roasted turkey, ham, provolone cheese, pickle filets and a creamy Italian dressing. Both sandwiches are made on artisan bread. IHOP, the International House of Pancakes, is celebrating its National Pancake Day and is giving away pancakes through 10 p.m. IHOP will then give participants the opportunity to donate to the Children’s Miracle Network, as raising funds for this charity is their main cause today. In San Diego all proceeds benefit the local Rady Children’s Hospital and Health Center. Pacific Beach’s famous Broke Yolk Café is also offering super cheap deals. To celebrate their anniversary, special entrees are only $3.10 and Mimosas are only 99 cents. Although it’s not free, it’s just as fun to celebrate the anniversary of a delicious local favorite for less than five bucks! So if you have the time, or more importantly—if you want to save the cash, you can stop in at Broken Yolk Café for a three dollar meal, then head over to Jack in the Box later for a free lunch, then later to IHOP for free pancakes (which are good any time of the day—but be sure to get there before 10 p.m.)! What a fantastic day for food in San Diego! Bon appétit! 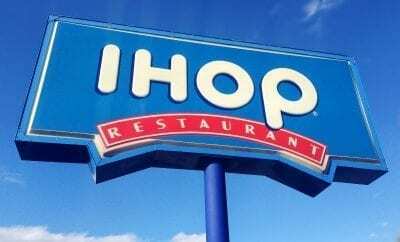 ← Previous Story IHOP National Pancake Day-free pancakes! San Diego Mayor Filner asks Jack to stop rebuilding Box.